What does it mean to be Gaelic? While many people in Ireland are familiar with Gaelic language, literature, music and sports, it is perhaps more difficult to identify an object or thing that might be described as typically Gaelic. This website forms part of a research project that seeks to explore the material culture of Gaelic Ireland, and to understand its relationship with Irish folk material. Is there a link between archaeological Gaelic objects, and the folk material traditions that seemingly emerge in Ireland in the 19th and 20th centuries? The research focuses specifically on western Ulster, a region west of the river Bann that encompasses present day counties Donegal, Derry, Tyrone and Fermanagh. 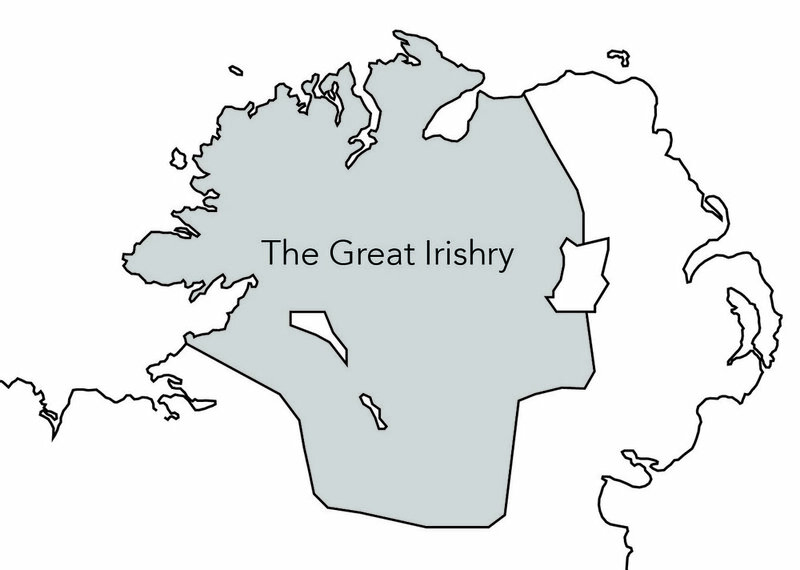 This region, known at one time as 'the Great Irishry' (see map on the left), is significant in the context of this research because it retained a largely autonomous Gaelic culture throughout the Norman period, until the decline of the Gaelic administration in the early 17th century. In the early part of the research, six object types were identified in Irish museum collections, almost all of which were discovered during turf cutting activities in bogs in western Ulster. The objects were not archaeologically excavated, and as such, lack the context that would typically allow researchers to understand how, when, and by whom the objects were made and used. Museum experts have tried, with varying success, to date the objects stylistically; through comparison with other known examples of similar appearance or design. Historical, archaeological, and folk research completed as part of this project indicates that while some of the object types seem to be of ancient origin, they may also have been in use over extremely long historical periods, and in some cases until relatively recent times. The ongoing research aims to understand the role of the objects in the context of medieval Gaelic Ulster. Why were the objects buried, abandoned, or lost in bogs? Who might have owned the objects, and how were they used? Why did these objects fall out of fashion, and how do they relate to the folk material that followed? In addition to answering these questions, the research incorporates a range of heritage science analyses designed to inform our understanding of the materials from which the objects are made, how old each object is, and to provide some clarity regarding their use. These analyses will contextualise the objects in relation to their historical find locations, and in so doing give the objects new relevance for the communities that live there today. We want to know what you think about these objects! 3D virtual models like the one on the left have been constructed for each of the objects, and visitors to the website are encouraged to view the models, and to get in touch to share their knowledge, understanding, or memories associated with each. If you are too young to remember these objects, do you have a grandparent, or an elderly friend or relative who might remember using objects like these? Nicholls, K. W. (1972) Gaelic and Gaelicised Ireland in the Middle Ages. Gill and Macmillan.